A NASA astronaut is charged with attacking her rival for another astronaut's attention early Monday at Orlando International Airport, the Orlando Sentinel has learned. Lisa Marie Nowak drove from Texas to meet the 1 a.m. flight of a younger woman who had also been seeing the male astronaut Nowak pined for, according to Orlando police. -- was wearing a trench coat and wig and had a knife, BB pistol, rubber tubing and plastic bags, reports show. Once U.S. Air Force Capt. Colleen Shipman arrived, Nowak followed her to the airport's Blue Lot for long-term parking, tried to get into Shipman's car and doused her with pepper spray, according to reports. Nowak, 43, is charged with attempted kidnapping, battery, attempted vehicle burglary with battery and destruction of evidence. Police considered her such a danger that they requested she be held without bail in the Orange County Jail, reports show. Nowak told police that she was "involved in a relationship with," Bill Oefelein another NASA astronaut, and categorized the relationship as "more than a working relationship but less than a romantic relationship," according to the charging affidavit. Nowak told police that she found out Oefelein was involved with Shipman and planned a trip to Orlando to talk to Shipman about their relationships with Oefelein. She told police the BB gun "was going to be used to entice Ms. Shipman to talk with her," the affidavit said. Shipman told police that when she arrived at the airport and was waiting for the airport satellite parking shuttle, she noticed a woman wearing a trench coat near the taxi stand. The woman boarded the bus after Shipman, according to police, and followed her to Shipman's car. When Shipman got into her car, reports show, she heard "running footsteps" coming toward her. Nowak tried to open the car door, then claimed she needed a ride, or use of a cell phone. When Shipman rolled down her window a couple of inches, Nowak "sprayed some type of chemical spray into the vehicle," reports show. Shipman is an engineer assigned to the 45th Launch Support Squadron at Patrick Air Force base, near the Kennedy Space Center. A 2002 graduate of Penn State University, she began working at Cape Canaveral in May, 2005, according to air base Public Affairs Officer Ken Warren. Police said that along with the weapons and other items in Nowak's car, they found e-mails from Shipman to Oefelein, Mapquest directions from Houston to the Orlando airport, and diapers, which Nowak told police she used so she wouldn't have to stop on the drive. Monday's arrest is the first-ever on felony charges for an active-duty astronaut, that the space agency was aware of, according to a spokesman. "Her status as an astronaut with NASA is currently unchanged. I cannot speculate on what might happen beyond that," said James Hartsfield, a NASA spokesman at the Johnson Space Center in Houston, where Nowak and Oefelein work. Nowak's biography shows she is a 1985 graduate of the U.S. Naval Academy at Annapolis with a degree in aerospace engineering, and a former test pilot who has logged more than 1,500 hours of flight in at least 30 types of aircraft. 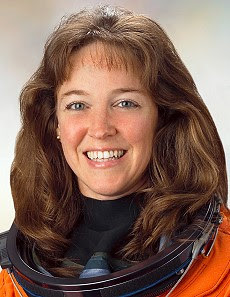 She joined the space program in 1996. Three members of her astronaut class died in the 2003 in-flight disintegration of Shuttle Columbia. Married and a mother of three children, her interests include running, playing the piano and collecting African violets, according to her NASA biography.